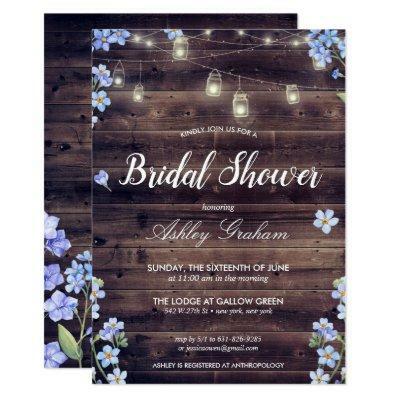 This Rustic Barn Wood Bridal Shower Invitation features white jar string lights and dainty blue Forget-Me-Not florals. Whether you’re organizing a large daytime celebration or going small with a simple and chic brunch, our rustic invitations are sure to fit the theme. Our invitations make for a memorable tea party, bridal shower theme or a rustic shower soiree! Add your custom wording to this design by using the "Edit this design template" boxes on the right hand side of the item, or click the blue "Customize it" button to arrange the text, change the fonts and colours and to also add additional information or images to this design. If you need any coordinating items, (thank you cards, etc.) please contact me for a custom order. ****For custom order, do not place this merchandise in your cart. Instead, email me your request at A link to your merchandise will be emailed to you once the item is available. You can use that link to place your order. Please allow up to hours.